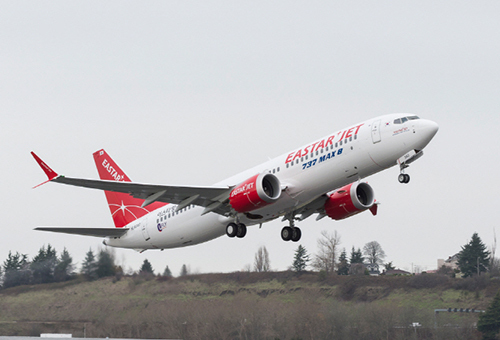 Eastar Jet, one of South Korea`s budget carriers, has decided to voluntarily take two Boeing 737 Max 8 planes out of service over growing safety concerns. The decision comes as a 737 Max 8 jet operated by Ethiopian Airlines crashed shortly after takeoff from Addis Ababa, Ethiopia on Sunday, killing all aboard, a second crash of the Boeing aircraft after Indonesia’s Lion Air tragic accident a few months ago in October 2018. The low-cost carrier said on Tuesday it will temporarily suspend the operation of the planes from Wednesday to ease customer concerns and make all efforts to minimize inconvenience. On Monday, the Korean aviation regulator sent safety supervisors to Eastar Jet for emergency safety checks, but no grounding order was given to the airline. Eastar Jet is the only airline that has operated the jet in the country while several Korean airlines previously announced a plan to add B737 Max 8s to their fleet in the near future. Eastar Jet also has planned to add more Max fleets later. Responding to the second crash, China ordered its airlines on Monday to ground all 737 Max 8 planes, and Singapore banned the model from its airspace. Several airlines in other countries – the U.K. and Australia – have followed suit. Contrary to the decisions by global peers and other countries, the U.S. regulator and American airlines have expressed confidence over the latest Max model built by U.S.-based Boeing. The American aircraft builder announced on its website late Monday (local time) that it will make a key change to the flight-control system in the 737 Max aircraft following the preliminary results from the Indonesian crash investigation indicating that erroneous data from a single sensor that the stall-prevention system relies on caused Lion Air’s accident. 4Coupang sales up 65% on year to record revenue in 2018 on widening los..